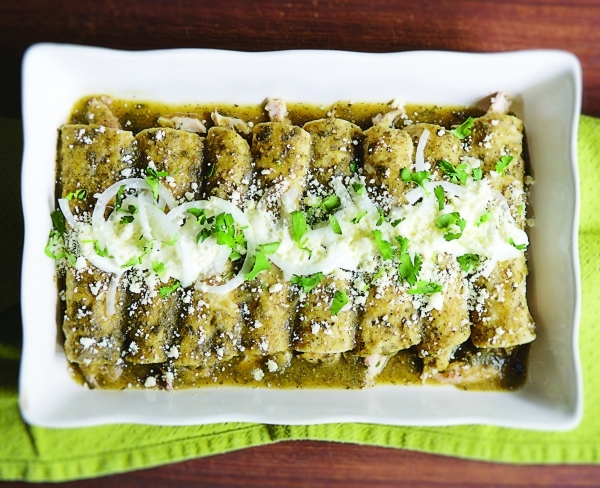 Here’s a sure-fire comfort food recipe to keep in your back pocket: Roasted Tomatillo Enchiladas. It’s the perfect balance of flavor — corn tortillas and the fillings provide toothsome texture, tomatillo sauce brings the brightness, Mexican cheese supplies the savory and onions and cilantro furnish the freshness. The best part? This dish comes together fairly quickly. Make it just once and you’ll soon be adding it to your arsenal of “go-to” weeknight meals. These will taste good with one pound of ground beef, pork or turkey (browned in a little oil alongside chopped onion and seasoned with salt), but I like them better with coarsely shredded cooked chicken, pork, beef, fish, shredded melting cheese or even goat cheese. Don’t forget: Snap pics of your finished dish and tag them #MoreBayless on Twitter, Instagram and Facebook for a chance to win an autographed copy of my new cookbook, “More Mexican Everyday.” Details here. yo veía tu programa en la televisión soy tu fan. 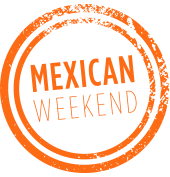 Y tu comida me recurda mi tierra Cuernavaca Morelos . Mexico como extraño mi tierra Mexico tiene diversos platillos exóticos y sobretodo el sazón que cuando lío llevas al paladar te quedas sin palabras ojalá en uno de mis sueños mi esposo me lleve a tu restaurante yo vivo en Manteca CA . Y desde aquí aplaudo tu trabajo. I am liking the way you prep your tortillas. I have always blanched them in hot oil one at a time, which takes a long time when you are making a large batch. Looking forward to trying out your recipe this weekend! I love your recipes. I DVR your cooking shows on KPBS and have several of your cook books. The first thing our son does when he travels to Chicago, is visit Frontera Grill. Thanks for posting your recipes and let me tell you; I am on my way to store to buy ingredients for these enchiladas! Just like I r emember from Cuernavaca. Guadalajara and Vallarta.Keep these recipes coming. 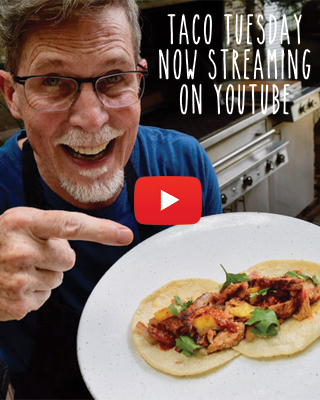 Saludos.seńor Rick Bayless gracias por su reseta . I do not like the tortillas in the micro. All this does is make them warm. In order to bring out the authentic flavor of a corn tortilla it must be toasted. This can be easily done on a comal or the coils of an electric stove without oil. …or a cast iron skillet. Not everyone has a comal and some of us have gas ranges. I’m sorry to see that you have bought into the idea of just warming tortillas in the microwave.If you really want to bring out the authentic taste of the corn in the tortillas, you must TOAST them. This can be done with no oil simply by using a comal or the coils on an electric stove. Yes, it takes more time, but it Is certainly worth the taste in the long run. I can’t wait to make the enchiladas especially with the easy tortilla prep, I had the pleasure to eat @ your Chicago airport rest, which no surprise very good! We also had the pleasure to meet you at the food show a few years ago, also very exciting, also enjoy your programs on kpbs, keep up the wonderful work you make my heritage very proud. I like the way you wrapped them, with tomatillo sauce, this looks so delicious. Love Rick’s recipes!! Warm the tortillas any way you wish but have you ever tried to roll a TOASTED tortilla for enchiladas! Ha, warm and soft for rolling is best, your covering it in sauce and baking it. My family is from Sonora,MX I love this recipe they are delicious.